Posted on Thu, Jan 19, 2012 : 8:13 p.m. I now have some knowledge of what it must be like to have been Steve Jobs at Apple. Like the mob scene unveilings of the next shiny new iPhone, iPad, or Apple Computer, at each new car introduction made at the North American International Auto Show, there is a mad rush by the swarm of thousands of videographers, photographers, and writers clamoring to be first on the Internet with new images and commentary. If only car customers would camp out for the next hot car! 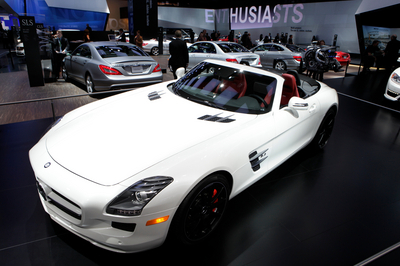 Mercedes-Benz shows off its new SLS AMG during the North American International Auto Show. Due to a scheduling fluke, the NAIAS now competes with the Las Vegas Consumer Electronics Show. With all the automotive gee-whiz electronic information and entertainment systems being offered, perhaps CES should move to Detroit! However, like a new Justin Bieber haircut or the latest Lindsay Lohan indiscretion, unveiling future products at the NAIAS appears to be cost-effective publicity, when compared to $4 million for a 30 second Super Bowl commercial spot this year. Marketing used to be just about the 3 P’s: product, price, and promotion. But more and more it is about building customer loyalty, which is the NAIAS buzz with the automotive companies priorities. Every manufacturer wants to extend an emotional connection between the buyer/owner and vehicle, analogous to the excitement that Apple brings with its iPhone and iMac/Macbook user community. Apple fanboys camp out so they can be first with the latest and greatest. Customers love the genius service at the Apple Store. Customers also don’t mind paying a premium price for better functionality and they loyally defend their favorite company on social networks and blogs. R.L. Polk, automotive marketing advisors, has monitored automotive customer loyalty for many years, by recording repeat buyers. For 2011, Ford won for the most loyal manufacturer, Jeep for the most improved brand, and Hyundai’s Elantra won in the competitive subcompact market. It isn’t a whole new experience for manufacturers. Certainly the brand loyalty of pickup truck owners is unrivaled between Ford F Series and Chevy Silverado owners. Growing up during the last millennium, I recall that Cadillac had a loyal following with professionals and small business owners in almost every community in the land, who annually bought a new Deville, Fleetwood Brougham. In a recent New York Times article, Christie L. Nordhielm, an associate professor at UM’s Ross School of Business said, “BMW in a sense is the Apple of the automotive industry. Apple delivers great user experience across products, and BMW delivers an exceptional experience across all types of automobiles.” Knowing more than a few BMW owners in Ann Arbor, I would tend to agree with Nordhielm’s opinion. Using social media more effectively to build loyalty is on every Detroit manufacturer’s agenda. But if the Big Three really want to improve on customer loyalty, I believe they really need to focus on the customer experience at the dealership, which is more tightly controlled by premium vehicle manufacturers. The showrooms need to be modern, fresh and clean, the service people need to show empathy and be problem solvers, the sales people need to know their product and competition better, and the trade-in experience shouldn’t make the customer feel like they’re being robbed. Also, the ease of maintenance needs to be engineered into the vehicle, so changing a $3.00 instrument light bulb doesn’t come with a $150 labor charge. David Kwan — aka The Car Nut — is a local developer and car enthusiast. Fri, Jan 20, 2012 : 6:37 p.m.
Several years I went out with cash in hand to find a car. Went 9 dealers all located within a route that made sense when maintenance would be required. Only two sales people took the time to talk about the features, the value of the car they thought appropiate when I gave them limits and needs. When it came to negotiating the same two sales people were courtious, knew their limits, didn't try finance tricks to improve their pocket book. That leaves 7 dealers I probably will not go back to. Those two same sales people get referances from me as often as I can give them. I truely hate the process of buying a car because past experience indicates dis-trust before I walk in the door. Why the manufactorers don't realize what affect that has on their product is beyond me. RunsWithScissors is right - it's a bait &amp; switch article. Fri, Jan 20, 2012 : 1:29 p.m. I used to take my car to the dealership for repair. More than once a tech bulletin from the manufacturer outlined the very problem I had. The reapir was easily made because of this. I also appreciated the connection the mechanics had with factory training. Becuse of the above, I didn't mind paying a few extra bucks. However, in the past few year, visits ended up as a way for the dealers to find things wrong. Of course, this led to repairing the imminent failure of various automotive systems. I can say the same for chain repair shops, as well. Happily, I found an independant shop I feel will not only tell me what is wrong, but give me an honest appraisel of what it might mean should I decline further service. Plus, their low overhead keeps prices down a bit. Fri, Jan 20, 2012 : 1:27 p.m. This article is like that ol' bait &amp; switch ploy. The headline promises a discussion on how to deliver better customer service at the dealership but the content, with the exception of the last two paragraphs, was one man's musing on the auto show. Last year I attended a friend as he visited a few dealerships in search of a new SUV. Afterward we had long discussions on our experience at each site - and not on the SUV's in question. As you may guess, this experience was a major factor in selecting a new vehicle. We can't tell dealerships how to provide a better experience but we do have buying power and we're not afraid to use it.